Join us this spring for a series of Bay Star Homes Rain Barrel Workshops offering residents across Hampton Roads the perfect opportunity to bring home a fully assembled 55 gallon rain barrel for just $20! Rain barrels help our waterways…and they help you too. They capture rain water before it has the opportunity to travel over land where it picks up pollution and debris that will eventually enter our waterways through ditches and storm drains. Less rain water flowing over lawns and hard surfaces means less polluted runoff in our waterways. Rain barrels can also help you conserve water. Outdoor watering can account for up to 75 percent of a household’s total water bill during the summer months. 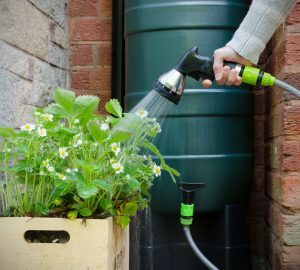 Rain barrel owners can take advantage of stored rain water for a variety of outdoor uses including watering plants and cleaning dirty lawn equipment or even their car! Workshop participants will also receive a Virginia native plant. Native plants are adjusted to the climate here in Hampton Roads and thrive with little maintenance. They also provide benefits for local wildlife – including pollinators like bees and butterflies. Thanks to the support from the Chesapeake Bay Restoration Fund, we are able to offer these workshops at the low cost of $20 per person. This fee includes both the assembled rain barrel and a Virginia native plant to brighten your landscaping. You can support restoration activities in Virginia, such as this, by purchasing a Chesapeake Bay license plate. Workshop dates and times are listed below. Due to the nature of the workshop, participation is limited to adults and kids ages 16 and up. Space is limited to 15 per workshop so please register early to secure your spot. Fee due upon registration. One registration per household, please. Download the event flyer to share this event with friends, coworkers, and neighbors! If registration for your desired date/location is full, feel free to register for another event or join the wait list by emailing your name and preferred event date/location to hrgreen@hrpdcva.gov. March 20, 2019 – FULL please email hrgreen@hrpdcva.gov to join the wait list. March 23, 2019 – FULL please email hrgreen@hrpdcva.gov to join the wait list. April 20, 2019 – FULL please email hrgreen@hrpdcva.gov to join the wait list.